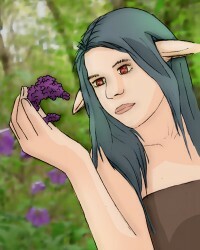 Because the Nazra often communicate telepathically it is difficult to understand or even recognize certain traditions. For this reason this article concentrates on the interaction with other species and the modern development, in which more often are used spoken words. While maintaining eye contact the Ya is raised slightly and lightens up softly. In contact with other species a verbal greeting is spoken additionally. The widespread ''Te'lay'' literally means "I like seeing you". If there's a more intimate contact the Nazra put their flat hand on the other's chest. This allows them to recognize the state of mind of their counterpart and also submit their own feelings. In telepathic farewell the head is tilted forward a piece and the eyes either not or completly closed. The spoken farewell is called Te'jun-aio, which approximately can be tranlated with "good succeed". Also widespread is Te'nooj'oki, which means about "bye for now". Often the Ya is tilted forward during the farewell, for example to corroborate once more a completed trade. In spring of their 8th birthday the young Nazra get the opportunity to work on their blossoms names. In this tradition everyone is looking for a flower which symbolizes their aim in life, for example due to a special color, an unusual pattern or the construction of the petals. The plant is then brought to an inhospitable place where the children ensure that the plant survives the next year despite adverse conditions. Many try it and care for their plants regularly which often causes a biological adventure. Insects, sunlight, frozen grounds and hungry animals are just a few examples of enemies the nature offers. Some build small houses for protection, some only observe and give at best a little water, others create force fields around their plants and others are looking for voracious insects and organize their natural enemies – the variety of possibilities is unlimited. Depending on the plant and place the care can be very simple. Next spring, when the blossoms are open, the goal is reached and the children share their experiences publicly. Out of the most impressive moments a blossom name is built, which they can decide to use additionally or instead of their actual name. Therefore a blossom name is always a good topic for discussion, whether you like to meet your opposite or just start a conversation. In every city there's a gardener who daily needs to water his plants. For this he uses a hose with an uniform water jet and makes a tour through the garden every time. In the process the amount of water can be regulated inside the building via a lever in 3 stages. To simply go through the 2nd stage has proved to be optimal. The problem is, that the lever switches at irregular intervals up one level and then back again. But that's enough to drown the just watered plant. How should the gardener solve his problem? He always leaves the lever at the highest stage, so the problem of the upshift is eliminated. The excess water is diverted and used in a different way, which is not part of the task. Obviously the lever is defective and has to be replaced. The gardener uses the 1st waterstage. This means that he has to stay longer at a plant but in case of an accidental upshift there's no problem. He installs a pipe system and by that he's able to water the plants simultaneously. The unwanted upshift then spreads evenly to all plants, so it isn't longer a problem. The gardener uses a bucket as temporary container which can be filled quickly with Level 3. From there a steady flow to the plants is controlled by hand. The gardener is not in charge of this problem because the plants will adapt over time.